Doctor was very knowledgeable, during the examination she was able to diagnose my issue and she confirmed her suspicionwith an X-ray and ultrasound. She has set a treatment plan and I am on the road to recovery. Doctor was very knowledgeable, during the examination she was able to diagnose my issue and she confirmed her suspicion with an X-ray and ultrasound. She has set a treatment plan andI am on the road to recovery. Very professional practice. The customer service was fantastic and the doctor made me feel very well and gave me all theinfo I needed. Very professional practice. The customer service was fantastic and the doctor made me feel very well and gave me all the info I needed. 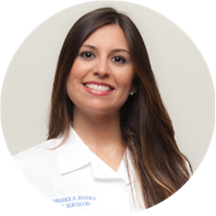 Dr. Mariola Rivera Morell is a caring, attentive podiatrist providing first-rate care to her patients. A graduate of the prestigious New York College of Podiatric Medicine, Dr. Rivera brings her clinical expertise to Aesthetic Podiatry and Sports Medicine Center. She is an expert in foot and ankle conditions, she specialize in the aesthetic correction of foot deformities and sports injuries. She is also bilingual, fluent in English and Spanish, and therefore able to give quality care to a wide variety of patients. So very helpful, as always! Dr. Morell was knowledgeable and helpful - hope my foot issue heals soon! Dr. Rivera Morell is a true professional. She is extremely knowledgeable, compassionate and she makes the entire experience stress free. I highly recommend her to my friends and family. overall it was very good. she was thorough , engaging and answered all my questions without making me feel rushed. Fantastic doctor. Very nice and clean office. Highly recommend. I will continue going to her as long as l need. The doctor was wonderful!! She is calm and super knowledgeable and allayed all my fears. The receptionist was awesome as I was lost and she came out to find me! Highly recommend ! Mariola was great! Took the time to explain everything, and was pleasant throughout! Very sweet doctor. Waited less than 5 minutes to be seen. I did not feel rushed at all. Dr Morell was fantastic. I was so impressed with how she analyzed my daughters feet and told her the areas of her foot she thought were causing the issues before my daughter even showed her the parts of her foot thathurt. She spent plenty of time explaining what to do next . Dr. Rivera was very friendly and nice, and illuminated things that helped explain several years of foot and back-related issues. She helped me with some short-term fixes for my weird foot pain for a long hiking trip, and advised me for long-term solutions as well. I will be back! I love that she speaks a Spanish and the way she talks and explains everything. Is clear and easy to understand. Dr Rivera is an outstanding Doctor . She is very calm and pleasant. Takes time with her patients to address all the concerns. extremely happy to have found her. Another excellent visit with Dr. Morell and office. She is just excellent. Very knowledgeable.Wish all doctors involved the patient as much as she does, really explaining the issue and answering questions. Very professional staff and Dr. Rivera was very informative, open to questions and offer her opinion in a very calm and not rushed, and took her time to adress my concern and treatment options. Definite 10 points excellent experience. I highlyrecommend her and encourage new oatients to experience Dr. Rivera. Thank you!!! She is lovely. And informative and helpful. She is FANTASTIC!! I lover her!!!!!!!!!!!! She went above and beyond for my heel pain!!! She’s very informative very helpful had great suggestions on how to correct Nd help my foot issue. I will definitely be going back to see her. The doctor was great. She was kind and explained things very well. I had a problem with the info I received in advance. I came via scooter because I am disabled. The doctor's office had told me by phone that therewas a "one inch step" into the building. Actually, it was more like a three or three and a half inch step, and I was afraid I would break an axle if I tried to drive over it, so I had to have my friend walk back to my apartment to get my walker. It delayed everything by half an hour or so. All's well that ends well. Finically a DOCTOR who listened to me. I have MS and any time I have an issue I’m told it’s MS related, which it can be but I want to at least explore other areas.. I am an athlete and notbeing able to participate in the things I love is not something a quick visit helps. Dr. Rivera Morell was outstanding and she made me feel for the first time in a very long time optimistic.. It was pleasant and informative. Learned a lot of information after the visit. Dr. Rivera Morell is a delightful, knowledgeable physician. She is up to date with new research and new treatments. I highly recommend Dr. Morell and the medical office. After months of getting no answers from other doctors, she treated my right foot - stress fracture, tendonitis in 2016. She is very thorough and thoughtful, answering all my questions. Shealso offered and provided alternative treatments like shock to reduce inflammation and stem cell transplants to help my foot finally heal. In addition, the office overall is very good. Very personable doctor! Took her time and listened to my symptoms . Overall excellent experience and highly recommend her to anyone that needs a Podiatrist in Westchester. She was incredibly thorough ! Gave us a lot of information. Very pleased with visit today ! Dr. Rivera was great! Very thorough and pleasant. I am a competitive runner and needed new athletic orthotics. I was happy to be fitted in my first visit. For my follow-up fitting it was like she never met me. She asked similar questions, including 'are these orthotics for runningfor walking.' I was shocked. She should at least read her chart before meeting with me. When I am spending hundreds of dollars on orthotics I would hope to be fitted by someone who cares and is knowledgeable. Also, the receptionist was incredibly rude. She booked an appointment without asking if the time worked for me. Will not be returning. Expert, and nice to boot. She was very knowledgeable of what was wrong and was very informative on what should be done. 10/10 would see again. The front desk is HORRIBLE. For this reason i will not go back however Dr Rivera is great. Here is the situation: the doctor does not accept some major insurances. But mine could have covered me out of network. My Specialistconsultations have a reasonable $ amount cap but Specialist Procedures like injections have no limits. On my initial visit instead of invoicing the normal consultation fee which is aligned with my cap and the additional procedure for the rest of the cost which would have allowed me allow to be reimbursed at 100% they did not do it and invoiced the consultation and procedure together as consultation which was way over the cap. When I called back they refused to make a change the invoice and help me! Also the front desk was supposed to give me some stretching and recover exercise sheets and never did. Real real bad service!!!!! Very kind and professional, I'm glad I came here. I came because I had pain on the balls of my feet, and was drawn to the practice because they specialize in sports. She was very accessible, and walked me through everything she observed. We reviewed X-rays together and she reallytried to educate me. We discussed the different options from conservative to more invasive without pushing me. I felt very comfortable. Dr. Rivera was very knowledgeable, thorough, and efficient. A true professional. Dr. Morell was both direct and comprehensive, and answered all questions I had regarding my medical concerns. She exerted patience, and was gentle with any medical intervention. I would return to Dr. Morell and this office. The office staff was also helpful with insurance concerns and barriers. She is an extremely lovely, knowledgeable, and tactful person. Although I am in good shape and active, my condition has to do with the aging proces. She made me very comfortable with that. She did I've me a cortisone shot, and offered other things I can do to treat this. I have lived with a Neuroma for 15 years before this visit!! !